Scrapping the print edition of the Christian Science Monitor may be the right thing to do for that publication, but the strategy would not be viable for most other newspapers. The plan to stop printing the Monitor this spring makes sense for it, because its audience is geographically dispersed and the continued cost of printing and mailing a physical paper is prohibitively high for a title whose circulation has shrunk to only a quarter of the 220,000 papers it sold in 1970. The Monitor also is under pressure to trim by two-thirds the $12 million annual subsidy it now receives from its patron, the First Church of Christ, Scientist, in Boston. So, abandoning print is a good call for the Monitor, which intends to put the bulk of its resources in the future into an upgraded website and a slick, weekly magazine. But a paperless strategy likely would not succeed at most general-circulation newspapers, which have no charitable endowments and draw the better part of 90% of their revenues from advertising in the print product. As discussed here, a newspaper would have to at least triple its online revenues from the current levels before it could break even. Until further notice, therefore, newspapers will need print editions in order to sell advertising, which is getting ever harder to come by. Newspapers also will need readers to convince marketers that someone is looking at their ads. And, as discussed below, readers are getting harder to come by, too. American newspapers have lost nearly a quarter of their subscribers since the industry's average daily circulation hit an all-time high of 63.3 million in 1984. Circulation has dropped by 23.6% over the last 24 years to 48.4 million today, according to the most recent figures provided by the Audit Bureau of Circulations and the Newspaper Association of America. 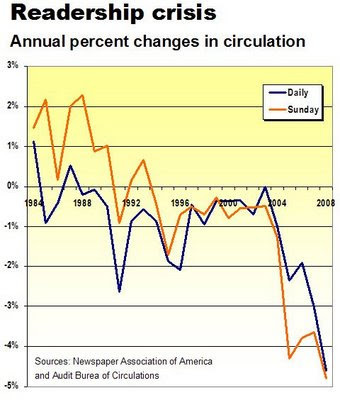 In the same period, average Sunday circulation has fallen 15.3% to a bit under 48.8 million. As you can see from the chart below, the industry has been unable to produce a gain in daily circulation since 1987. Sunday sales have not shown any positive momentum since 1993. While newspaper circulation has weakened since the 1980s, the decay has accelerated sharply since 2003. Sunday circulation, which had been relatively more resilient than daily sales, now is falling more precipitously than daily sales. Today’s daily circulation is back to where it was in 1945 and the Sunday sale is where it was in 1965. Though circulation is at pre-Baby Boom levels, the U.S. population has more than doubled since the mid-1940s. If you divide circulation by population, you will find that fewer than 18 out of 100 Americans today buy a daily or Sunday newspaper. Back in 1945, 36% of the population bought a daily paper and 31% took a Sunday edition. The formidable problems of the newspaper industry won’t get solved if industry leaders substitute voodoo economics for rational discourse. So, let’s dispense with some of the bad juju we have heard in the last couple of days. Not once, not twice but five times, Gary Pruitt, the chief executive at the McClatchy Co., told stock analysts that the sagging sales and profits at his company are the result of “secular headwinds” which evidently will abate at some point to enable his business to revive. By definition, a secular move in an industry refers to a permanent and fundamental shift, such as the change in consumer preference to automobiles from horses and carriages. The ups and downs of the economy do create headwinds for business. But a secular change is more like gravity. Unlike headwinds, which eventually blow over, gravity is here to stay. For the record, the secular forces dragging down newspapers are: Declining readership, shrinking advertising, high fixed costs and growing online competition that makes it increasingly difficult to charge the premium ad rates that were possible prior to the Internet. Several (but certainly not all) of the more than 100 distinguished media figures attending the stimulating New Business Models for News Summit at the City University of New York were captivated by the suggestion from one speaker that newspapers could solve their problems by forsaking the production of the print product, which represents 60% of a paper’s operating expenses. While it is true that killing the print product would save a bundle of money, it also must be noted that an average of 90% of the revenues at American newspapers are derived from ads sold in the print product. If the company abandoned print but were able to double its online sales to $20 million, it would lose $14 million in a year, for an operating margin of a negative 70%. To break even, the prototypical publication would have to more than triple its sales from the current levels. To make a profit of 15%, the company would have to quadruple it sales. This is a tall order, given that some two-thirds of the interactive revenues at most newspapers came from the so-called “upsell” of online classified ads to recruiters, auto dealers and real estate brokers. With the print product historically the primary attraction for many of those classified advertisers, how many premium-priced, online-only newspaper ads would they buy if free ads on Craig’s List were only a click away? Which, as you know, they are. Despite mounting declines in sales and circulation in recent years, most newspapers today still generate profits surpassing those of many Fortune 500 companies. But the fat profits are coming to an end, because newspapers are running out of ways to cut costs. After producing operating earnings at an average rate of 27.3% between 2000 and 2007, the industry’s margin this year may average no better than 20%, says William Drewry, a managing director of the global media group of the UBS investment bank. Average earnings before interest, taxes, depreciation and amortization (EBITDA) were 24.6% in 2007, according to UBS. 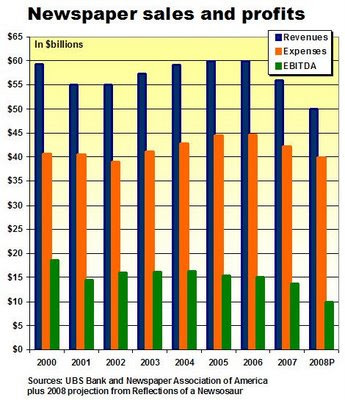 Assuming the industry this year generates $40 billion in ad sales and $10 billion in circulation revenues, EBITDA of 20% would carve $3.7 billion, or, 27.2%, off the approximately $13.7 billion in profits that newspapers collectively realized in 2007. A profit plunge of this magnitude would be a big problem for such companies as GateHouse, Journal Register, Lee Enterprises, McClatchy, Media General, MediaNews, Minneapolis Star Tribune, Morris Publishing, Philadelphia Media Holdings and Tribune, which each loaded up on debt during the halcyon days of the credit market to fund ambitious acquisitions. They and their lenders were counting on continuing rich profits to pay off the debt. But those expectations have been dashed by the rapid and unprecedented secular decline in newspaper advertising sales that commenced in 2006 and has gathered momentum ever since. Now, publishers are trapped between funding their debt and sustaining the massive, inherently inefficient infrastructure required to produce content, sell ads and manufacture newspapers. To date, most publishers have elected to buttress their profitability as much as possible by attacking the two most elastic expense categories: staffing and paper consumption. But this short-sighted effort may be compromising the quality of the core product to such a degree that it actually may speed the decline of the industry as publishers attempt to transition to a new, more sustainable business model – assuming one is out there. For all that ails them, most newspapers at the moment remain remarkably profitable enterprises. But they are running out of the quick fixes that have plumped their bottom lines despite the historic contraction in advertising demand. When the quick fixes are exhausted, as they soon will be, then profits will plunge and publishers will have little, if any, spare cash left to fund the strategic print and interactive strategies that otherwise would enable them to reinvigorate their weakening franchises. As proof of the industry’s amazing power to produce profits, you need look no further than its performance in the first three months of this year. Despite a 14.4% drop in industry-wide print advertising revenues in the first quarter, the average operating profits of the seven largest publicly held newspaper companies fell only two percentage points to 17.6% from 19.5% in the same period, according to Fresearch.Com. To put this in perspective, Journal Register Co., a publisher that already has defaulted on its reckless debt, still generated a 16.9% operating margin in the last 12 months. That surpasses the margins in the same period of such companies as Exxon (15.7%), General Electric (14.2%), Boeing (8.7%), Wal-Mart (5.8%) and Amazon.Com (4.7%). With sales decaying at an accelerating rate for the last 36 months, the industry’s earnings have been preserved only through the down-sizing of staffing and newshole, the two expenses that can be most readily mitigated in a time of diminishing revenues and rising expenses for everything from newsprint to health insurance. In their efforts to cut expenses, publishers most prominently targeted payroll, which historically has represented half of their costs. Publishers have trimmed staff to some extent at almost every level and several newspapers have cut costs dramatically by outsourcing such functions as customer service, advertising composition, printing and delivery. Next to payroll, newsprint, which traditionaly represents 20% of epenses, is the next biggest cost for a newspaper. Many publishers have reduced the ratio of news to advertising in an effort to offset a 28.9% increase in the cost of this essential commodity in the last 12 months. While shrinking demand for newsprint ordinarily would lead to lower prices, the paper mills have been aggressively slashing production capacity to keep prices high, shutting inefficient plants or using their remaining factories to produce other types of paper. Given this behavior, it is reasonable to expect that publishers will get no relief from escalating newsprint costs. Unless a publisher does something radical like finding a neighboring newspaper to print or deliver his newspaper, most of the rest of the costs associated with running a newspaper are fixed and beyond his control. Even when expenditures are reduced by slashing payroll, newshole or outsourcing copy editing and page layout to an offshore vendor, these one-time savings cannot be replicated in subsequent years. In the face of future inflation on almost every front, profitability can be sustained or increased only if sales grow. Flat or declining sales inevitably will result in ever-lower profits. And a rapid deceleration of sales like the one that has been under way since 2006 will result in an accelerating decline in profitability. A case in point is the McClatchy Co. As its sales fell 15.2% in the first nine months of this year, its EBITDA dropped almost twice as fast to 17.5% from 24.6% in 2007, wiping out $166.4 million in operating profits from one year to the next. This sort of thing not only rattles investors on Wall Street – that’s why newspaper shares are trading at all-time lows – but also imperils a company’s ability to repay its loans on a timely basis. Foreseeing the shortfall in earnings this year, McClatchy renegotiated its loans to gain more time to repay its debt. Unless the company can stimulate its sales and radically reduce expenses, however, it, like most other publishers, could be on a trajectory to insolvency. The bitter irony for the newspaper industry is that the desperate reductions in staffing and newshole are compromising dangerously the quality of the products that built each of its valuable franchises. The compromises, which typically dismay most loyal and discerning newspaper readers, are likely to speed the declines in circulation and sales that are the root cause of industry’s faltering profitability. Thus, publishers are caught in a vicious, downward spiral with no easy way out. Developing portfolios of multiple, targeted print and interactive products that will acquire new audiences, tap into fresh advertising dollars and, thus, diversify their revenue and profit base away from a once-lucrative but increasingly threatened business model that has not materially changed in 250 years. If newspapers had invested in new products even a modest fraction of the bodacious profits they reaped in the last decade and a half, they might have invented anything from MarketWatch to Yelp to Google. Instead, publishers concentrated on accelerating profits to lift the stock prices that determined their bonuses and/or borrowed what proved to be dangerously large sums of money to buy more of the newspapers they regarded as perpetual money-making machines. The newspaper industry is far from alone in suffering today for the smugness and greed that suffused the extended age of irrational exuberance that began with the Internet bubble and climaxed in the credit-default flop. But newspapers are unique institutions. While life will go on if any given bank, shoe store or auto dealer fails to emerge from the economic miasma, we have yet to identify any institution that can fulfill the vital role played in every community by an independent, economically healthy, properly staffed and professionally edited newspaper. Although the economy will recover in the fullness of time, there are very real doubts about whether newspapers still have the time, resources and ingenuity to migrate to a viable new financial model to assure their long-term survival. The global effort to revive the credit market isn’t working fast enough for newspapers, which are losing many traditional advertising accounts as retailers and auto dealers go out of business. Given the growing dominance of big-box merchants like Wal-Mart and Costco – which tend not to advertise in newspapers – it is highly doubtful that new merchants will emerge to replace the departing retailers when the economy improves. Among the chains that have commenced the liquidation of their businesses in recent days are Whitehall Jewelers, which runs 373 stores in 39 states; Linens ’N’ Things, which owns 371 stores in 48 states; Mervyn’s, which operates 149 department stores on the West Coast, and Shoe Pavilion, which has 64 locations on the Wets Coast. Boscov’s is closing 10 of its 49 stores in the Northeast in the hope of emerging from bankruptcy, while Circuit City, the No. 2 electronics retailer, is thinking about closing 15o of its 1,400 outlets in hopes of staying out of bankruptcy. Auto dealers are shutting their doors from Connecticut to South Carolina to Omaha to Texas to California – and almost every point in between. In every case, it’s the same story: Tight credit and weak customer demand. While these grim circumstances eventually will pass, it is difficult to see how new retail and specialty stories will emerge to compete with the big-box merchants who have the sales volume, buying power, superior logistics and balance sheets to power through the recession – and perhaps grow even stronger. As for auto dealers, the Big Three domestic factories each were planning to reduce the number of dealerships even before the economy hit the mother of all speed bumps. If General Motors can scrounge enough money to merge with Chrysler, then dealer consolidation will be even swifter and more severe. Not even Tesla Motors – the upstart Silicon Valley car company that today announced layoffs of its own – will ever fill the advertising void. Since there already is a celebrity-packed waiting list for its sole product – a $109,000, two-seat electric Roadster – it is not likley the company ever will be inclined to buy an ad offering free hot dogs, popcorn and pony rides for the kids. The average online advertising rate plunged by almost half in the first nine months of the year, according to an industry survey. 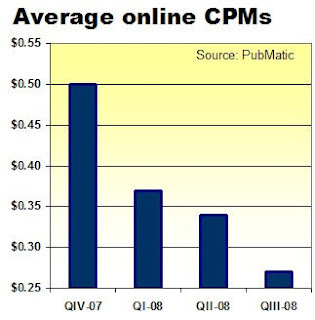 Demonstrating that even interactive advertising is not immune to the deterioration of the economy, PubMatic, a company which helps publishers optimize their revenues, reports that the average rate for 1,000 ad impressions (also known as CPM for "cost per thousand") fell to 27 cents in the third quarter from 50 cents in the fourth quarter of 2007. That’s a decline of 46% in the space of nine months. In this case, the direction this year has been most assuredly down. After climbing in the first three months of the year, ad rates fell sharply in April, flattened from May through June and then plunged again in August, according to the survey. Unless the global economy miraculously turns around on a dime, newspaper advertising revenue may plunge some $7.5 billion in 2008, according to a new projection attempting to assess the impact of the meltdown on the industry. Should this forecast prove to be correct, sales would tumble by 16.5% to $37.9 billion from last year’ s depressed level and the industry will have lost a staggering 23.4% of its revenues since producing a record $49.4 billion in sales in 2005. Prior to the historic collapse of the worldwide financial markets, I projected on Sept. 5 that print and online sales would drop about $5.4 billion to $40 billion from the 2007 level, barring “unforeseen events.” Given the ferocity of the ensuing unforeseen events, my revised forecast now shows the industry this year could shed an additional $2.1 billion in sales, bringing the total estimated decline to $7.5 billion. The true number could come out higher or lower, depending on further developments. But it will be difficult to undo much of the damage the credit crisis already has done. Even if all the leaders of the all the world’s governments uncharacteristically adopted a well conceived and well orchestrated rescue plan to jump-start the credit markets, it would take a substantial amount of time and effort to mend the mangled finances and rattled psyches of millions of households and businesses. :: Retailers who are seeing consumer demand dry up at the same time they are struggling to borrow the money they need to make payroll and stock their shelves. :: Auto dealers who can’t sell cars because many potential buyers are postponing purchases and the customers who try to buy cars often can’t get loans. Meanwhile, dealers are scrambling to finance the fleets of unsold vehicles clogging their lots. :: Real estate agents who can’t find buyers because no one knows what anything is worth and, owing to a paucity of transactions, can’t afford to buy ads to sell homes that no one wants to buy. The few brave souls stepping forward to buy homes generally have found mortgages difficult or impossible to obtain. :: Employers who aren’t buying help-wanted ads because their businesses are shrinking, not expanding. Many report difficulty borrowing the working capital they need to buy raw materials or make payroll while they await payments for goods and services they already have provided. In an effort to translate the effects of these grim circumstances into a revised sales forecast, I assumed that third-quarter sales performance would be only slightly worse than it was in the in the first half of the year, because the credit markets didn't seize up until mid-September. But then it gets ugly. As detailed in the table below, I trimmed classified revenues in the fourth quarter to half of the prior year’s level in the auto, realty and recruitment categories, because each would be affected most directly by the credit collapse. I was more conservative in cutting the expectation for retail advertising for the fourth quarter, because I believe merchants will do everything possible to sustain their ad schedules during the holiday period that determines the profitability of their businesses for the year. If there is not a sharp turnaround in the economy after the first of the year, the sales in this category could collapse in 2009 in a tide of bankruptcies and desperate cost cutting as the surving merchants strive to remain viable. In light of the 2.3% drop in online ad sales in the second quarter, I projected a modestly accelerating decline in that category for the balance of the year. Although most newspapers generate two-thirds or more of their online sales from the three major classified verticals, I am assuming publishers will push as much of the remaining classified revenue as possible to the online side of the ledger to preserve the impression – but not necessarily the reality – that the web remains a growth area. While the publishing business (though not all individual newspapers) has survived every economic calamity in the nation’s history, this downturn could be uniquely catastrophic for an industry that has been struggling for the last three years to retain its relevance among readers and advertisers. Even during the economically robust years of 2006 and 2007, newspaper advertising fell a total of $4 billion, or 8.2%, from the all-time peak of $49.4 billion achieved in 2005. A drop to $40 billion in sales this year would be equal to an 19.1% slide from the 2005 level. But the newly projected drop to $37.9 billion in sales this year would amount to a 23.4% decline from 2005. Bleak as this immediate prospect is, the long-term outlook is not much better. It is not clear how the industry will recapture its former vigor when the economy rebounds, given that its revenue base was disintegrating well before the economy fell apart. Macy’s has gobbled up many of the Main Street department stores that traditionally were among the best newspaper advertisers, substituting instead a national brand strategy relying more on television and magazines than newspapers. Between the economically expansive years of 2004 and 2007, Macy’s reduced its advertising spending at newspapers by $249.1 million, or 29%, according TNS Media Intelligence. CompUSA, a major newspaper advertiser, absorbed the Good Guys, another major advertiser, and then went out of business at the beginning of this year. Circuit City is hanging on by a thread and manufacturers are being warned not to ship it merchandise because they might not get paid. If Circuit City, the penultimate national electronics retailer, goes away, will Best Buy keep buying Sunday inserts every week? If General Motors merges with Ford or Chrysler, how many car dealers will shut their doors forever? Well before ordinary mortals ever heard of credit-default swaps and other financial weapons of mass destruction, auto classified advertising at newspapers fell by $1.8 billion, or 35%, between 2000 and 2007. 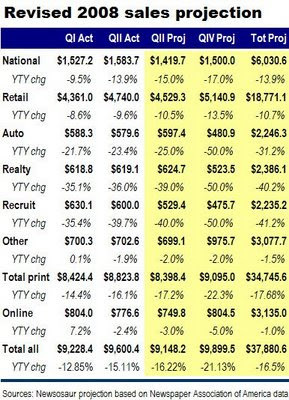 If the self-employed real estate agents and mortgage brokers who buy newspaper ads can’t make a living during the extended housing downturn, they will exit the business, as many already have. Real estate advertising at newspapers in 2007 fell by $1.2 billion, or 22.6%. In the first six months of 2008, the category slid another $681.9 million, or 35%. If consumers in the future can buy and sell homes on their own at Zillow – or use a cheaper fixed-price agent like Redfin – will real estate advertising as we knew it come back? Craig’s List, Monster, Simply Hired and many others have eviscerated the one-time newspaper monopoly in recruitment advertising since the tech bubble burst, resulting in a loss of $4.9 billion, or 56.3%, of classified revenues between 2000 and 2007. Will the employers who were buying newspaper ads before the economy cratered still use them when the economy recovers? Will they be around to consider it? The newspaper industry’s unwillingness or inability to diversify its revenue base since the start of this century has hitched it to the fates of the retailers, car dealers, real estate brokers and employers who are struggling to keep their heads above water in the worst business conditions since the Depression. If those accounts succumb, who will replace them? It already has happened in McPherson, KS; Mesa, AZ; Gilroy, CA, and Cambridge, MD, according to Peter Zollman, who has been tracking the trend at Advanced Interactive Media Group (formerly Classified Intelligence). Still, I was surprised to get a call recently from someone at a large metropolitan newspaper, who asked if I thought canceling the Monday edition would be a good idea. “Like turning the paper into a themed edition aimed at a carefully targeted audience of untapped readers and advertisers,” I responded. :: A fan website, where visitors would be encouraged to voice their opinions about the teams through a full range of multimedia self-publishing tools. It would include diaries from local players, blogs, fantasy leagues and such viral features as video and music mashups. To build buzz rapidly, the newspaper might partner with the leading sports-talk radio station or top television sportscaster in town. :: A mobile alert service to flash sports scores and headlines to subscribers 24/7, while reminding them to pick up the paper, contribute to the website and patronize the participating advertisers. The above products would provide a seamless, cross-media solution for marketers trying to reach a liberal-spending but hard-to-reach audience known to consume such products as beer, cars, clothes, computers, electronics, gaming services, insurance, mobile phones, travel, athletic equipment and almost every form of entertainment. Not only would the suite of sports products create a rich marketplace, but also many of the readers and advertisers would be newfound readers and advertisers. Newspapers have what it takes to make it happen. They employ large staffs of content-production specialists, possess large printing plants, operate major websites, maintain comprehensive distribution systems and support the largest local sales organization of any media company operating in their respective markets. Further, the print and online media they already produce provide thousands, if not millions, of essentially free impressions each week to market the new sports products. Although some additional upfront costs would be associated with launching the new sports media, the outlay makes a lot more sense than eliminating publication on certain days of the week, because skipping days won’t reduce the bulk of the formidable, fixed costs involved in running a newspaper company. Even if scrapping the Monday paper saved a day’s worth of newsprint, ink, fuel and staffing, most papers still have to sustain the physical and personnel infrastructure they already have in place to support seven-day production. Regardless of whether a paper was published six days a week or seven, it would have the same expenses for rent, insurance and leases on its equipment and fleet. It’s also safe to assume that full-time newspaper employees would not willingly forfeit a seventh of their pay. Even if a newspaper saved enough money to justify not publishing on Monday, how does this radical cost-cutting strategy solve the industry’s over-arching problem: Shrinking sales. No company can cut its way to prosperity when its revenue base is contracting, as it has been for newspapers since 2006. Instead of asking ad departments to extract seven days worth of revenue from six days of publication, doesn’t it maker more sense to give the ad staff more (and better-targeted) products to sell to a wider range of advertisers? There’s no reason to stop with just a sports paper on Monday. The newspapers that have created “Mom” websites need to robustly expand and vigorously market these initiatives as full cross-media solutions for readers and advertisers alike. One day of the week could be turned into a themed edition emphasizing stories – and advertising – associated with family life, education, dining, fitness and other topics of interest to both working and stay-at-home moms. Other themed days of the week could be built around the key classified categories. And so forth. The Boston Globe recently announced plans to publish a weekly sports tabloid that will be produced every Thursday and cost 50 cents a copy. This is not as radical as turning the Monday paper into a free sports tab. And maybe the less-radical approach is a better idea. Let's hope the Boston venture encourages other revenue-starved publishers to think about doing something more creative than going dark on Monday, Tuesday, Wednesday, Thursday and, well, you get the idea. For all the care newspapers put into their presidential endorsements, a mere three out of 10 people are likely to pay them any heed, according to the Pew Research Center for People and the Press. If editors and publishers can overlook this seeming repudiation of their wisdom, they can build valuable new engagement with their readers – and non-readers – by taking a cue from American Idol. Rather than publishing just the usual single, well-crafted opus cranked out by the anonymous editorial-page staff, newspapers can invite readers to submit their own endorsements for the candidate of their choice. Once editors pick, polish and publish the best of the endorsements in print and on the web, readers would be invited to select for their favorite citizen-penned editorial. Cutting-edge newspapers could encourage people to vote via their mobile phones, just like American Idol. The contest would be marketed by a viral online campaign leveraging things like Facebook (where Barack Obama has more than 2 million friends and John McCain has 560,098 pals) and the multitude of blogs that have flowered in the rich political ferment. It also could be publicized on local radio and television. The presidential bake-off could bring a hundreds of fresh readers to the newspaper and its website – including, especially, the younger consumers who statistically eschew newspapers but, by all accounts, are jazzed by this year’s presidential contest. If they liked what they saw, they might come back again. The new Chicago Tribune is a dumbed-down dud in the opinion of a passionate and dedicated group of core newspaper readers back in my hometown. There is an admitted bias to the critics, as each of the eight members of this impromptu focus group happens to be a journalist old enough to be a fellow alumnus of the Chicago Daily News, which ceased publication in 1978. But these friends and former colleagues – we stay in touch via a monthly newsletter and a Yahoo group ­– represent precisely the sort of college-educated, high-income, home-owning professionals that the Tribune touts as its target audience. 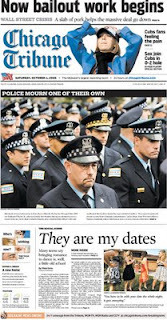 While my former colleagues are north of the median age of 35.5 in the Chicago area, so are most newspaper readers. Where only 33% of people between the ages of 18 and 24 read newspapers, 59% of people between 55 and 64 still look at them, according to statistics from Scarborough Research reported at Journalism.Org. So, the opinions of older consumers do matter, as they are the bedrock of newspaper readership. And this group is not happy with a makeover they believe has drained much of the remaining gravitas from this once-esteemed newspaper. While the Trib’s front page did contain a banner over the nameplate referring readers to stories inside about the economic crisis, another Daily News alum noted that the article on the national surge in unemployment – which ran on page one of the New York Times – was relegated to an abbreviated business section tucked behind a local news front. In a sports-crazed city like Chicago, you had to look twice to find a reference on yesterday’s front page to the fact that both the White Sox and Cubs were in the playoffs. “How could they miss that?” asked a colleague who phoned to express his dismay. Colleagues were puzzled by the space-hogging graphics that seem to be a hallmark of the new look mandated at each of the Tribune Co. properties. The makeovers coincide with a company-wide cut in the newshole to 50% of the available space from the former 60%. The gaudy graphics and Eyewitness News approach at the new Tribune appear to be aimed at attracting the sort of younger readers who already consume its sister publication, a free-distribution tabloid called the Red Eye. Filled with celebrity sightings, snarky articles and beer ads, the Red Eye looks great but is utterly bereft of intellectual heft. It evidently has been sufficiently successful at capturing untapped readers and newfound ad dollars that its editor was promoted to managing editor of the Tribune, where it undoubtedly is hoped she will work her magic again. The strategy for attracting younger readers may or may not work, given the long-running decline in newspaper readership among the least senior cohorts of the population. Where Scarborough found that 54% of people between the ages of 18 and 24 read newspapers in 1999, the number dropped to 34% in 2007. Meanwhile, the Tribune seems to have alienated some of its best customers. Several of my colleagues are so dismayed by the change that they are switching to the New York Times or Wall Street Journal, saying they will visit the free websites of the Tribune or Chicago Sun-Times to keep up with the local news. Do you think the economy will be better in 2009 than it was in 2007? Me neither. So, how could the Newspaper Association of America predict that total advertising sales for the industry will drop by “only” 5.5% next year when they fell by 7.9% in 2007? Assuming newspaper sales follow historic trends, revenues this year are on track to slide to $39.9 billion, an unprecedented 11.5% plunge that would make for the lowest volume since 1996. The NAA sales forecast, reported here yesterday by Editor and Publisher, coincides with my projection here in early September. But both forecasts may prove to be too optimistic, because they do not take into account the severe and unprecedented constriction of the credit markets in the last two weeks that has prevented most businesses and individuals from borrowing the money they need. The credit crunch contributed to a 26.6% drop in auto sales in September, most likely will lead to further unemployment in almost every industry and lead to the bankruptcies of more businesses like the largest Chevrolet dealer in the nation. Individual consumers in many cases have lost access to home-equity credit lines and have been barred from borrowing money for cars and homes – or faced dauntingly high interest rates for doing so. And the value of almost everyone’s home and retirement account has taken a severe thrashing. With everyone broke – or at least feeling like she or he is – retailers are bracing for the one of the worst, if not the worst, holiday seasons in years. Retailers, who generate almost half of all newspaper revenues, are suffering from both depressed consumer demand and the inability to borrow the money they need to stock their shelves. As discussed here, more than a dozen retail chains already have filed for bankruptcy this year — double the volume of bankruptcies in 2007 – and more are expected early next year, barring a yuletide miracle not only on 34th St. but in Main Streets and malls across the land. We are in uncharted territory for the economy as a whole and the newspaper industry in particular, given the stress on the retailing industry and the long-running erosion of ad sales in the major classified categories – auto, employment and real estate. Publishers will fool no one but themselves if they rely on happy talk from the NAA or ancient rules of thumb to project their future revenues. They need to get out of their offices and start talking with their advertisers about the realities of life in these straitened and admittedly frightening times. Then, they to need build realistic, bottoms-up budgets that will sustain their franchsies while they eke out the investments necessary to position their businesses for future growth in interactive and niche print products when the economy improves. Which, as hard as it is to believe, it will.